Hobbies for kids: Stamp collecting. Stamp collecting can be a fun and rewarding hobby. 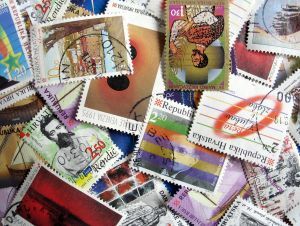 There are thousands and thousands of colorful stamps from different countries and different points of history to collect. This makes stamp collecting both interesting and educational. You can learn about different parts of the world through collecting stamps from other countries. Each country will usually have stamps that represent things that make that country special. This includes leaders, famous entertainers, animals that can be found in that country, historical events, historical figures and more. There are stamp collectors of all types. Some collectors are quite serious and collect stamps as an investment. However, most stamp collectors collect stamps just for the fun of gathering them. You can begin collecting with little or no money just by getting stamps off of your everyday mail. This sometimes can be the most fun way of collecting as you just never know what type of stamps are going to show up.